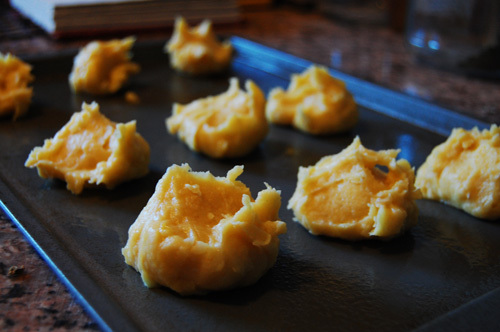 Recently, I posted my mother’s recipe for cream puffs. In the post, I mentioned that cream puffs can easily be adapted into something more savory. 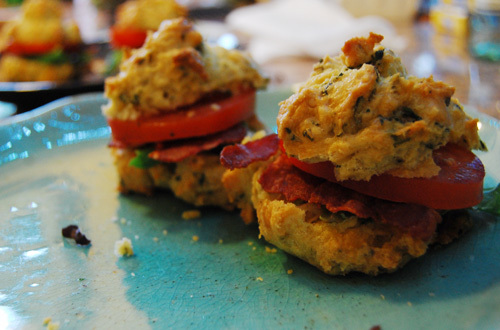 This week, I tried that theory out, making bacon, lettuce, and tomato puffs. Into the puff I mixed fresh chopped cilantro, a little cheese, and some salt, which made the flavors more sandwich like. I filled them with turkey bacon, mixed greens, and fresh tomatoes. They would also be delicious with a jalapeño mayonnaise or a little red onion. I also wanted to apologize that posts have been a little few and far between lately. I’ve been crazy busy lately with wedding stuff (I know, I know, what an excuse!). Dan and I have also been trying to watch our waistline because of the aforementioned nuptials, which makes my penchant for butter a problem. I promise that I’ve got a nice queue of recipes for the summer, some healthy, some more buttery than ever, and all coming soon! Boil water and add butter, stirring until melted. Remove from heat and add in your flour, herbs, and salt. Mix until it forms a ball around your spoon. Mix in one egg at a time, totally incorporating one before adding the other. Spoon balls of dough onto a greased baking sheet, making sure each ball has a peak. This should be enough dough to make four large puffs. Bake for 10 minutes at 400 and then 20 additional minutes at 350. Begin by cooking your bacon until crispy. Slice your tomatoes into thin slices. Once your puffs are baked, slice in half. Layer one slice of bacon per puff, and add tomatoes and mixed greens. Don’t feel shy about adding your own improvements- condiments or onions, avocados or sprouts! I think it’s great that you have decided to find cooking from your earlier life and make it available to others. I really miss my grandmother’s cooking and I’m pretty sure I’ll never be able to find any of that since both her and my grandfather have long since passed. I think that nothing remains of her recipes. What I will probably have to do is research popular dishes from her part of the country(Johnstown,PA)and try to recognize some of the stuff she used to make. I’ll be checking back for sure and follow you on twitter.